The sunrises of the past week have been pretty spectacular. Colors of pink, yellow, and orange wash the sky with their beauty. This morning I was up early and watched the progression of the sunrise (my photo doesn’t do it justice). At first, the sky was pink. After a while, yellow and orange appeared and the pink faded. I miss the sunrises of Texas. With more sky and less trees to block the view, I felt like I had a center-stage seat for the sunrise at times. As I was enjoying this particular treat, I suddenly remembered the times the kids and I headed to school. 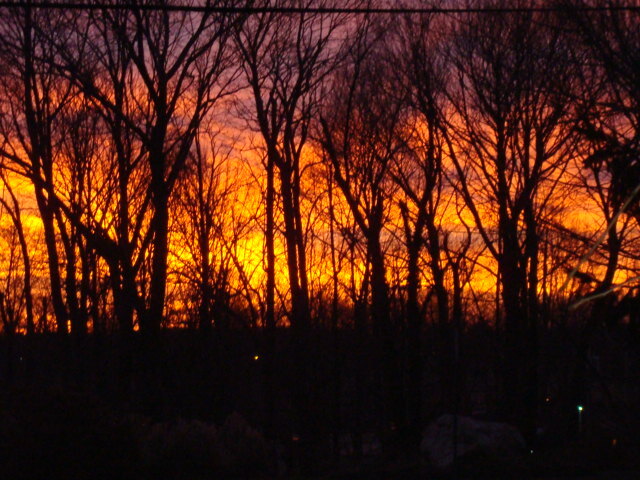 Some mornings, as I turned onto Valley Mills Dr., I was overcome by the beauty of the sunrise. As the sun would crest the horizon—a huge, glowing orb—all I could say was “thank you, God.” How dull the sky (and our lives) would be without sunrises and sunsets! Sunrises are a small thing—a daily occurrence even if we can’t see them. Yet what a gift it is to begin the day with a smile and the ability to recognize true beauty. Sign up to receive the latest updates from Alicia!